JAZMYNE ANDERSON TTN file photo Coach Fred Turoff (right) presents then-senior Patrick McLaughlin (far left) during senior night in 2010. Former gymnast adjusts to new role. Former All-American Patrick McLaughlin wasn’t ready to leave the men’s gymnastics team after competing four years as an all-around competitor for the program. Last season McLaughlin earned qualifying bids to compete at the National Collegiate Men’s Gymnastics National Qualifier in three events: the pommel horse, parallel bars and high bar. He qualified to compete on the parallel bars at the NCAA Championships and became the first men’s gymnast since 2005 to earn All-American status after placing seventh in the event. A two-time captain during his stint with the Owls in 2008-11, McLaughlin said he wanted to see his former teammates progress in the years to come. A vacancy opened up on coaching staff after former assistant coach Theo Maes stepped down before the current season. Maes, an All-American himself on vault, coached four seasons for the Owls and saw his former teammates graduate from the program as well. “[McLaughlin] is enthusiastic and he’s having a great time,” coach Fred Turoff said, who is entering his 36th season as head coach of the program. 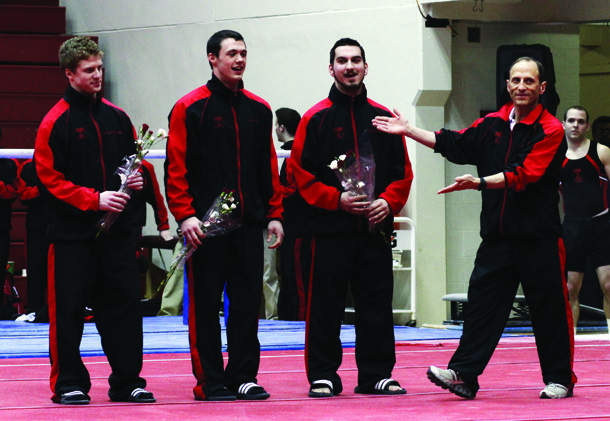 Recently the men’s gymnastics team defeated its Eastern College Athletic Conference rival the No. 11 Illinois-Chicago Flames at a tri-meet held at McGonigle Hall last Saturday night. The Owls also defeated the No. 15 Springfield (Mass.) Pride. The Flames have won the past three conference championships, while the Owls have finished as runners up during the last two years. Senior Adam Al-Rokh took the all-around title at the home meet with a combined score of 83.000 points through the four events. Al-Rokh said having McLaughlin as a coach this year has helped his development as a gymnast. “I guess you can say [McLaughlin] is there, inside your head, with you when you’re on the event because that’s nice to have,” Al-Rokh added. McLaughlin said that his transition from a competitor to the sidelines is just as “stressful” for him. However, a difference that he has discovered so far is how he’s no longer able to personally influence the team’s score. “I was worried a lot about my training before and now I can be a lot less selfish,” McLaughlin added. McLaughlin said he’s focused on preventing the team’s chance of injuries during practices as well. In the 2010 season, McLaughlin faced a career-threatening ankle injury, but was able to receive a redshirt season from the NCAA to have a complete senior season. “The biggest thing I’m trying to do is keep them all safe,” McLaughlin said. With eight seniors on the team, McLaughlin said he is pulling for each of them to succeed this year. The Shrewsbury, Pa. native said during his past seasons with the current upperclassmen, the team remained close and supportive. Connor Showalter can be reached at connor.showalter@temple.edu. Senior Patrick McLaughlin led the way for Temple with a career-high all-around score of 87.000. Junior Blake Collins, who was cut from Temple his freshman year, has stepped in for injured senior Patrick McLaughlin in the all-around for the first time.